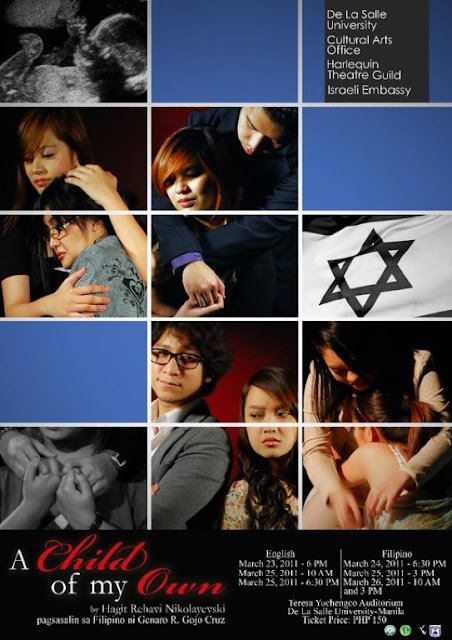 In partnership with the Israeli Embassy, the Harlequin Theatre Guild (HTG), the resident theatre organization of De La Salle University (Manila), is proud to present A Child of My Own, a play by Hagit Rehavi Nikoleyevsky, based on the book by Amia Lieblich. The play is directed by Raffy Tejada, HTG's Artistic Director. The play will also show its Filipino version, Ang Sarili Kong Anak. Set in an apartment building in Israel shared by four women, the play portrays an uncommon means of having a child while discussing social issues such as: gender roles, sexuality and maternal health issues; focusing on the situation of modern women, involving their maternal health in relation to the assisted reproductive technology, specifically artificial insemination. For tickets, contact Nina Bunsoy at +63.917.5211963 or Janeth Salceda, Cultural Arts Office Secretary at (632) 524-4611 loc. 702.